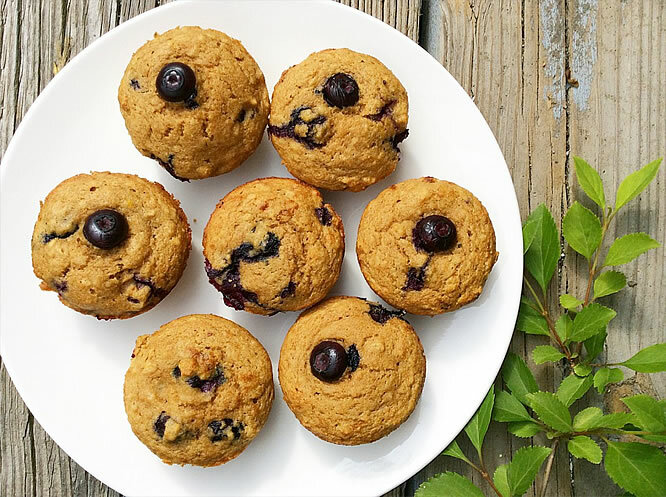 HeadingThese amazing muffins are the perfect breakfast, coffee break snack, or hostess gift. Preheat oven to 375 degrees Fahrenheit. Line a 12-cup muffin tin with paper liners, or grease with nonstick spray and set aside. Combine first 6 ingredients (all wet ingredients) in a mixing bowl and whisk to combine. Add remaining ingredients to the bowl (all dry ingredients), including blueberries, and stir with a wooden spoon or rubber spatula just to combine. A few small dry clumps are okay, just don’t over mix the batter. Use a 1/3 cup measuring cup to evenly divide the batter among the 12 cups in the muffin tin. They will be almost full to the top. Bake for 18-22 minutes, or until golden and cooked through. A toothpick inserted into the center should come out clean, and the muffins should spring back when gently pushed with your finger. Cool slightly in the pan, then remove to a cooling rack to let cool completely, if not eating immediately. Store leftovers in an airtight container at room temperature for up to 2 days; because of the wet blueberries in the muffins, these will spoil quickly. If you are left with a lot extra, these freeze well, and can be quickly defrosted in the microwave.